BILLERICA, Mass., Feb. 14, 2018 /PRNewswire/ — Bruker is pleased to announce that AOAC International has approved the MALDI Biotyper solution for two new Official Methods of Analysis (OMA) for the confirmation and identification of pathogenic and non-pathogenic bacteria. The two methods include some of the most common food pathogens, including Salmonella spp (spp means all species of the genus Salmonella), Cronobacter spp, Listeria spp and Listeria monocytogenes, as well as the identification of other Gram-negative and Gram-positive bacteria. Confirmation and identification can be performed directly from several selective culture media that are widely used in food microbiology, or from any non-selective culture plates. The added value of using the MALDI Biotyper as a very fast and cost-effective microbial confirmation and identification solution is now also broadly available for food safety authorities, for food industries, and other food and feed testing facilities. This can improve efficiency in food testing laboratories and accelerate the turn-around time for food producers until critical production steps are monitored, and lots can be released. Validation studies have proven the performance of the MALDI Biotyper for the direct confirmation and identification of bacteria from the selective media recommended by the FDA, ISO and USDA, as well as from several chromogenic media, and from any non-selective culture media. The approved benchtop MALDI Biotyper system is also available as an MBT smart version with an even faster, proprietary smartbeam™ laser that further accelerates the speed of analysis and decreases time-to-result. The MALDI Biotyper Subtyping Module enables a high confidence differentiation of the Listeria species. The MALDI Biotyper workflow can be supported with the MBT Pilot™ for optically guided sample preparation on the MBT target plates, and with the MBT Galaxy™ for automated matrix deposition during the sample preparation. Both workflow tools further improve the productivity and workflow standardization. New disposable MBT Biotargets 96 plates based on Bruker´s proprietary AnchorChip™ technology can be used for optimal performance. Erin Crowley, the Chief Scientific Officer at Q Laboratories in Cincinnati, Ohio, commented: "Q Laboratories was grateful for the opportunity to serve as the Expert Laboratory on these two OMA validation studies. The success of these projects was supported by the easy workflow of the MALDI Biotyper. We have implemented the MALDI Biotyper in our facilities since 18 months already. It is truly an innovation and its OMA approval is a significant step to provide our customers with rapid and accurate identification and confirmatory options needed to make critical decisions." Q Laboratories Inc. is an ISO/IEC 17025 accredited laboratory providing comprehensive microbiological, analytical chemistry and R&D laboratory services to companies around the world. In business since 1966, Q Laboratories serves the food, pharmaceutical, cosmetic, dietary supplement and personal care product industries and is the first Expert Laboratory in North America to be recognized by the three major certification bodies AFNOR, AOAC International and MicroVAL. Dr. Daniele Sohier, Business Development Manager for Industrial Microbiology at Bruker Daltonics, added: "Working in collaboration with AOAC International and Q Laboratories was a real pleasure and very efficient. We were able to get these two OMA claims in only 6 months, corroborating the reliability and robustness of the MALDI Biotyper for fast and accurate confirmation of many foodborne pathogens and for the identification of other bacteria. The MALDI Biotyper is broadly used in clinical microbiology already. With the AOAC International approvals for two OMAs, we now also have access to regulated food microbiology markets, which represents a further significant market expansion for the MALDI Biotyper." The MALDI Biotyper family of systems enables molecular identification of microorganisms like bacteria, yeasts and fungi. Classification and identification of microorganisms is achieved reliably and quickly using proteomic fingerprinting by high-throughput MALDI-TOF mass spectrometry. The MALDI Biotyper uses a molecular approach based on specific protomic fingerprints from bacterial strains. Many published studies have highlighted the greater accuracy and lower cost offered, as well as typically much faster time-to-result (TTR). Applications of various MALDI Biotyper solutions include clinical routine microbial identification, environmental and pharmaceutical analysis, food safety and quality, taxonomical research, as well as marine microbiology. In many European and international laboratories the MALDI Biotyper has replaced classical biochemical testing for bacterial identification in the past few years due to the accuracy, speed, extensive species coverage, ease of use and cost effectiveness of the system. Traditional biochemical techniques detect different metabolic properties of microorganisms, can take many hours or even days for completion, and they often lack specificity. For more than 55 years, Bruker has enabled scientists to make breakthrough discoveries and develop new applications that improve the quality of human life. 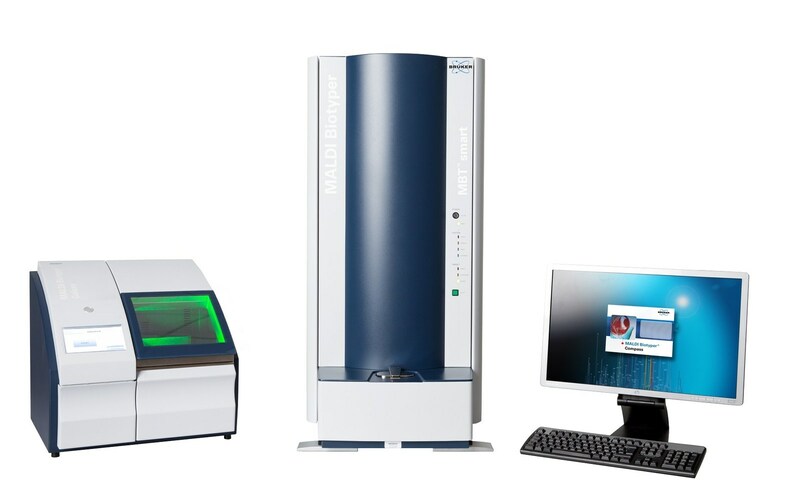 Bruker's high-performance scientific instruments and high-value analytical and diagnostic solutions enable scientists to explore life and materials at molecular, cellular and microscopic levels. In close cooperation with our customers, Bruker is enabling innovation, productivity and customer success in life science molecular research, in applied and pharma applications, in microscopy, nano-analysis and industrial applications, as well as in cell biology, preclinical imaging, clinical phenomics and proteomics research, clinical microbiology and molecular pathology research.